UPDATED: Sat., March 11, 2017, 7:40 p.m.
Preet Bharara, one of the most high-profile federal prosecutors in the country, said he was fired Saturday after refusing to submit a letter of resignation as part of an ouster of the remaining U.S. attorneys who were holdovers from the Obama administration, according to people familiar with the matter. Bharara’s dismissal was an about-face from President Donald Trump’s assurances to the Manhattan-based prosecutor in November, weeks after the election, that he wanted him to stay on the job following a meeting at Trump Tower, according to Bharara. Two people close to Trump said the president’s chief strategist, Stephen Bannon, and Attorney General Jeff Sessions wanted a clean slate of federal prosecutors and were unconcerned about any perception that the White House changed its mind about Bharara. The removal of former president Barack Obama’s federal prosecutors is about asserting who’s in power, the two said. The departure of Bharara, the U.S. attorney for the Southern District of New York, capped a confusing sequence of events, beginning Friday, when acting Deputy Attorney General Dana Boente began making calls to 46 prosecutors asking for their resignations by the end of the day – including U.S. Attorney Mike Ormsby of the Eastern District of Washington. Requests for resignation are a normal part of a transition of power from one administration to another, although both the Bush and Obama administrations let their U.S. attorneys leave gradually. During Friday’s call with Bharara, the New York prosecutor asked for clarity about whether the requests for resignations applied to him, given his previous conversation with Trump, and did not immediately get a definitive answer, according to a person familiar with the exchange. When asked Friday whether Bharara was also being asked for a resignation letter, one White House official not authorized to speak publicly said, “Everybody’s gone,” and would not engage further on the issue. On Saturday morning, when the administration had still not received Bharara’s resignation, Boente attempted to call the U.S. attorney to find out why, but the two men did not immediately connect, according to people familiar with the discussions. When they finally did speak shortly before 2:30 p.m., Boente informed Bharara that the order to submit his resignation indeed applied to him because he was a presidentially appointed U.S. attorney, according to a Justice Department official with knowledge of the conversation. Bharara asked Boente if he was firing him and Boente replied that he was asking him to submit his resignation, the official said. 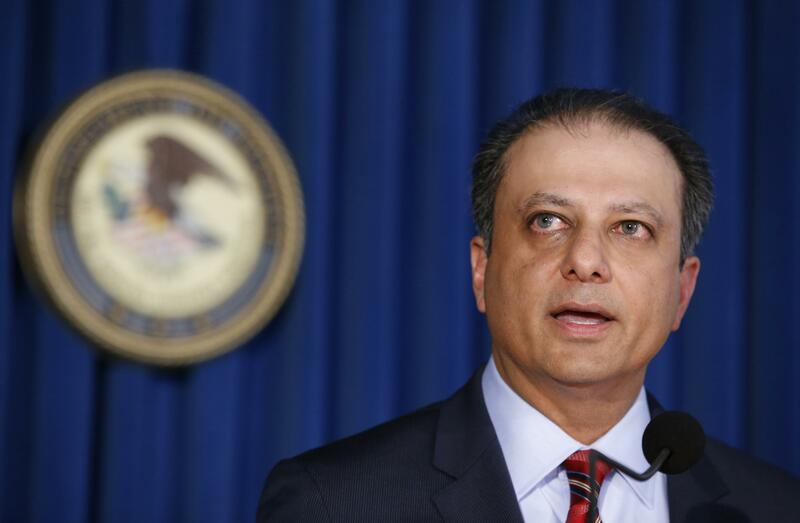 Bharara sent an email to his staff, asserting again that Boente had removed him from his job. Within the Justice Department, some are questioning whether a recent phone call from Trump to Bharara may have contributed to the decision to remove the Obama holdovers, according to a person familiar with the matter. On Thursday, a White House aide called and left a message for Bharara, saying the president wanted to speak with him, though the prospective topic of discussion was unclear. Bharara consulted his staff and determined that it would probably be a violation of Justice Department protocols for him to speak directly to the president, this person said. That protocol exists in order to prevent political interference – or the appearance of political interference – with Justice Department work. Bharara then contacted the chief of staff for the attorney general, Jody Hunt, told him of his own determination, and the two agreed that it would be a violation of the Justice Department protocol for Bharara to call the president back. Bharara then called the White House staffer who had left the message and said he wouldn’t be talking to the president, and explained why, this person said. It’s unclear whether the Trump call and its aftermath had anything to do with Friday’s decision. Bharara, who was born in India and came to the United States as a child, had a particularly powerful perch in the criminal justice system. The Southern District of New York has 220 assistant U.S. attorneys, making it one of the largest federal prosecutors’ offices in the country. During his tenure, Bharara indicted 17 prominent New York politicians for malfeasance – 10 of them Democrats. Along with his bipartisan prosecutions, Bharara developed a reputation for being tough on insider trading, although he was criticized for the lack of prosecutions that followed the financial crisis. Bharara was an outspoken man in a job that has been held by vocal and politically aspirant predecessors, including former New York mayor Rudolph Giuliani, FBI Director James Comey and former Supreme Court justice Felix Frankfurter. There is no indication that the ouster of Bharara stems from a disagreement about a particular case or investigation. While the FBI has been conducting a counterintelligence inquiry looking for evidence of contacts between agents of the Russian government and Trump campaign advisers, and a former campaign adviser to Trump has been part of an investigation into possible overseas corruption, there have been no signs that Bharara’s office has been involved in either of those probes or any other inquiries that might touch on the president or people close to him. On Wednesday, watchdog groups asked Bharara to probe whether Trump has received payments or other benefits from foreign governments through his business interests in violation of the Constitution’s emoluments clause, which prohibits top officials from receiving favors or payments from foreign governments. Initially after Trump won the presidency, it looked as if Bharara’s position was safe. Trump brought up Bharara’s name in November during a phone conversation with Sen. Charles Schumer, D-N.Y., whom the president-elect was calling to congratulate on becoming the leader of the Senate Democrats, according to people familiar with the matter. In that conversation, Trump said he was thinking of keeping Bharara in his job, these people said. Schumer praised Bharara and Trump then arranged a meeting with Bharara at Trump Tower. During the conversation, Trump told Bharara to call Sessions, his nominee for attorney general, who also asked Bharara to stay, people familiar with the conversation said. When Bharara was leaving, according to one person, he asked the president-elect what he should tell the reporters in the lobby. Trump told Bharara to tell them he was staying on, this person said. Bharara told reporters afterward that the president-elect, “presumably because he’s a New Yorker and is aware of the great work that our office has done over the past seven years,” asked to meet with him and discuss whether he would remain in his position. Published: March 11, 2017, 12:30 p.m. Updated: March 11, 2017, 7:40 p.m.